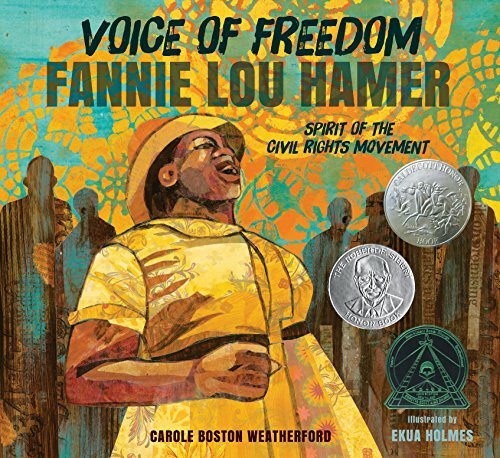 If you know little or nothing about the shocking life of civil rights activist Fannie Lou Hamer, this new picture book can get you all caught up. It is aptly titled Voice of Freedom: Fannie Lou Hamer, Spirit of the Civil Rights Movement, and it offers an in-your-face compilation of the many events that made up Ms. Hamer’s rocky life. Fannie endured other indignities, like failing an illegal literary test designed to prevent her from voting, being threatened because she encouraged blacks to vote, and being arrested and beaten to within an inch of her life for ordering breakfast at a white-only lunch counter. But Fannie’s life wasn’t all bad. She accomplished great things in both her personal and professional life: she married a good man, adopted two daughters in need of a home, and eventually became one of the first African American women ever to sit on the House Floor in Congress. Fannie’s rollercoaster life is captured in an array of earth-toned collages by illustrator Ekua Holmes that bring a smile to the lips even as they transport readers back to the wild west of the civil rights wars.